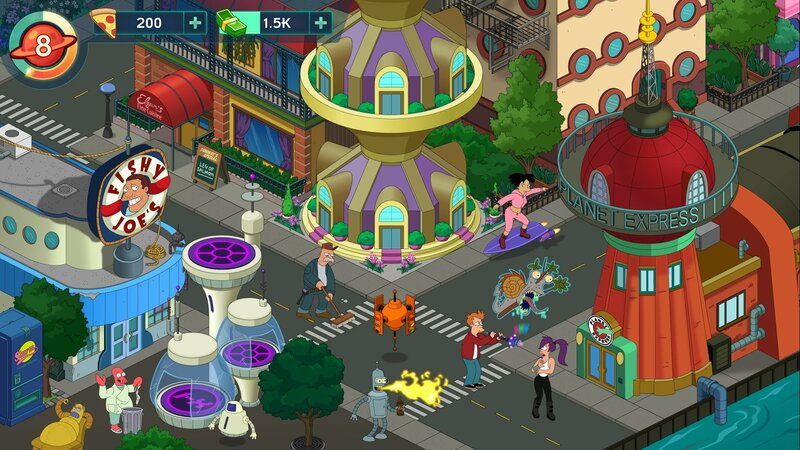 Battle rings, Hypnowaves, and more -- how you can get started in the new Futurama mobile game. The latest Futurama game is finally upon us, and Futurama: Worlds of Tomorrow is a much more robust title than the games before it. Combining the best of role-playing games and city-building titles you’ve probably seen several of before, it’s a new way to see the world of Futurama, especially with it being removed from streaming services in an expedient manner. You’ll be going after the crew of the delivery ship Planet Express and restoring New New York to its former glory while completing missions here and there as you fly throughout the galaxy, but there are a few important things you should know first before you head into battle. These tips and tricks should help you on your way to victory. Saddle up with these starter pointers and you’ll be flying solo in no time. You’ll have to make sure you level up your Planet Express crew evenly as you work through the game, much like leveling up Pokemon or members of an PG party. When you level members up you get additional combat power and actions to complete in New New York. You get specific career chips to level each character up, and those will do in a pinch, but if you choose the right color and career chip, you’ll get additional experience for your trouble. This is a great way for you to keep up with who’s doing what and level up characters even faster for your time. And everyone wants to get more experience, right? If you’ve got crewmen available milling around the ship, then you’re wasting resources. This game is all about maximizing what’s available to you at any given time, and all of your crewmates are able to pitch in and help things out in their own special way. Make sure you assign every crewman to a different activity going forward, because every minute you don’t have someone working for you that’s a minute that you’re losing out on extra money and experience points. Put your employees to work, and don’t feel bad about it! Your Planet Express ship will utilize the fuel it has on board as you head out and complete missions. If you have crew members who are working on missions, go ahead and finish those before zipping off into space. Because you have to choose your crew before going to the next destination, it’s actually cheaper on you and simpler to go ahead and go where you need to go first and then come back to let your crew finish things out. Trust us, it’s better in the long run. Make sure you follow the combat tutorial near the beginning of the game and learn all about the importance of a well-timed tap here and there before you get too deeply entrenched in the game. Watch the rings as they get closer to you or your enemy and make sure you know how and when to tap so you can land crits and take down the damage you might otherwise soak up like a sponge. The lives of your crew (and yourself) are in your hands! Now get out there and own the universe, and make sure you build up New New York City again to its former glory while doing so!